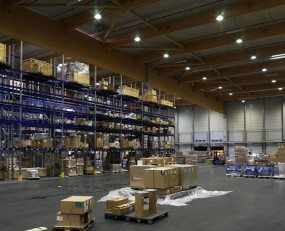 Kuehne + Nagel is moving into a new logistics facility in Regensburg built by Goodman. The logistics facility in GVZ bayernhafen, which is approximately 16,000 sq m, consists of two units and is scheduled for completion by the end of 2019.
bayernhafen in Regensburg is the logistics hub when it comes to freight traffic in Eastern Bavaria and inland shipping throughout Bavaria. GVZ is an important transhipment point and links the Regensburg area with international traffic routes. This 185-hectare harbour area – comparable with 259 football pitches – is home to more than 80 companies, creating around 1,800 jobs. „The new building is a clear commitment to the Regensburg location and to the strong East Bavarian economy. We are creating the infrastructure so that our customers can continue to develop in the best possible way”, said Henning Mack, regional manager Bavaria at Kühne + Nagel.